We’d love your help. Let us know what’s wrong with this preview of This is How it Ends by Eva Dolan. One night after a rooftop party with her fellow holdouts, El Ella Riordan is a community activist who became famous when she was beaten by police during a social protest. Now Ella is a squatter in a building where the owners are evicting tenants so they can convert it into luxury condos, and she’s determined to stay and defend the few holdout tenants, despite death threats. To ask other readers questions about This is How it Ends, please sign up. Did you like the two characters - Molly and Ella? Victoria No, I didn't really like either of them and I think that is why I didn't particularly enjoy the book. Eva Dolan has written a superb bleak and atmospheric psychological thriller that provides background of how the the horror that resulted in the Grenfell Tower disaster came to manifest itself. It covers the burning issues of gentrification and the social and economic cleansing of the poor and the working class whilst the property developers ruthlessly profiteer in London. Dolan gives us a rare glimpse into the alternative lifestyles and lives of the political activists, revealing their human riv Eva Dolan has written a superb bleak and atmospheric psychological thriller that provides background of how the the horror that resulted in the Grenfell Tower disaster came to manifest itself. It covers the burning issues of gentrification and the social and economic cleansing of the poor and the working class whilst the property developers ruthlessly profiteer in London. Dolan gives us a rare glimpse into the alternative lifestyles and lives of the political activists, revealing their human rivalries and flaws. Young idealistic Ella Riordan is a blogger and activist squatting in a tower block where most tenants have been evicted, she is protesting at plans to turn it into luxury flats. She is holding a roof top party to promote her book, when she ends up in her apartment below with a dead body of a man. She is feeling nervous and fraught as she phones Molly for help. Ella claims it was self defence which leads the two women to hide the body in a elevator shaft. Repercussions from their actions follow. The narrative is delivered from the perspective of Ella and Molly, Ella's chapters go back in time to the present whilst Molly's go forward in time. Ella, it turns out is a PhD student from a wealthy family background who has been beaten up by the police in a protest. Her family are less than happy with her political activities. Middle aged Molly is a principled and experienced campaigner with a long history in dedicated political activism beginning at Greenham Common, but there has been precious little reward in any sphere of Molly's life. The relationship between the two women is at the heart of the story, with shades of a mother and daughter dynamic. However, before long Molly begins to suspect that Ella not been truthful about what happened and their relationship begins to decidedly fray. The web of lies, deceit and murder becomes apparent and there is a huge unexpected final twist. This starts as a book about taking on the system, about the little guys and gals railing against the system. A housing project in London is due to be destroyed to make way for luxury housing. Ella, a young blogger and anti-gentrification activist, is trying to fight the proposed project and help the six remaining owners. Molly is another more long term activist. One night, at a party for Ella’s upcoming book, there’s a death and Molly and Ella cover it up. I didn’t buy into their reasoning for doing so. The book is told from each woman’s POV, and also from before and after the night of the party. I struggled with Ella, even the Ella of before the cover up. Flip side, I was sympathetic to Molly. Maybe because she’s closer to my age, but I appreciated all she’d given up through the years to be an activist and what those choices had now cost her. As an American, some of the protests named as part of Molly’s history were unknown to me and I had to google them to see if they were real. They are. This was an interesting premise for me. Because it’s not a clear cut fight. The building in question is old, “ a toad of a building”, with “the smell of mold and rot”. It wasn’t a building that called out to be saved. And with only six families remaining of 300, it seemed more a fight for the sake of a fight than one designed to really change anything. Now, I was reading an advance copy so I’m not sure if this is intentional or not. Was there a message in the lack of capitalization of some, but not all, formal names and the first word in many, but not all, sentences? There is a huge twist at the end that I didn’t see coming. In fact, the ending was worth a half, if not a full, star. Because up until then, this book wasn’t really drawing me in. My thanks to netgalley and Bloomsbury USA for an advance copy of this book. 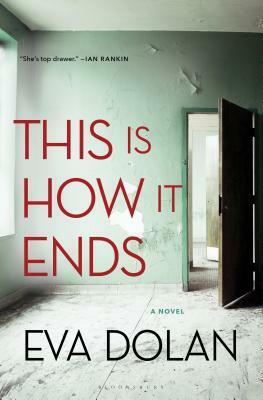 This Is How It Ends by Eva Dolan is a psychological thriller. The story is told from alternating the prospective between Ella and Molly and also flashing back into the past to the events leading up to where the book begins. As it starts off Ella has called her friend Molly to help her when after her party she finds herself with the body of a dead man. Ella claims to have been attacked and only defended herself but of course Molly doesn’t trust the police and offers to help Ella cover up the crime This Is How It Ends by Eva Dolan is a psychological thriller. The story is told from alternating the prospective between Ella and Molly and also flashing back into the past to the events leading up to where the book begins. As it starts off Ella has called her friend Molly to help her when after her party she finds herself with the body of a dead man. Ella claims to have been attacked and only defended herself but of course Molly doesn’t trust the police and offers to help Ella cover up the crime by ditching the body in the almost abandoned building they had been fighting to save. The book then begins changing between the two ladies as it goes back to show how they had met and the campaign to save the building in which Molly lives. But it also has chapters in the current time after the murder in which Molly begins to question Ella’s story of just what happened that night. I have to say that it seems when I was finished that I really seem to be in the minority on this book but unfortunately I just didn’t end up liking it much at all. My biggest problem started off when I just didn’t really care or connect to either Ella or Molly although I will say I liked Molly a bit more. But with not really connecting to either main character it just seemed to make everything that came after drag at a snail’s pace and I found it easy to put this one to the side which is rare for me. The idea of fighting for the low income against the rich might have been intriguing if I could get behind the characters but instead I just didn’t find it interesting at all and couldn’t find it in me to care about the details to how Ella ended up with a dead man, I was more thinking oh just arrest them all so I can move onto my next read. So needless to say this one just wasn’t my cup of tea although the majority of reviewers do seem to love this one. EXCERPT: 'I'm going to expose you,' he snarled. The laughter caught in her throat. It was as if he was there in front of her, face contorted with rage, body blown up and pumped for the fight. A man ran up the stairs, clipping her shoulder as he passed, but she hardly noticed. 'And I know how you did it,' Quinn said. THE BLURB: Ella Riordan is a community activist who became famous when she was beaten by police during a social protest. Now Ella is a squatter in a build EXCERPT: 'I'm going to expose you,' he snarled. THE BLURB: Ella Riordan is a community activist who became famous when she was beaten by police during a social protest. Now Ella is a squatter in a building where the owners are evicting tenants so they can convert it into luxury condos, and she’s determined to stay and defend the few holdout tenants, despite death threats. MY THOUGHTS: I really did not connect with this book. I read it. I finished it. It was okay. The book is told from two points of view, Ella's and Molly's, over two timelines, then and now. In some cases this works; in this case it doesn't. There should, ideally, be a 'trigger' for the change in timelines for it to flow smoothly. In This is How it Ends, this never happened. The changes appear to have been totally random, with nothing connecting the switch. I spent a great deal of time feeling confused and going back to the previous chapter to try and figure out what precipitated the change. Usually, the answer was nothing. This is How it Ends failed to keep me interested. I would read a chapter or two, then wander off to look for something else to do. I never thought I would see the day when I would prefer housework to reading! It wasn’t bad enough that I felt like I should abandon it, but it is not a book that I will be recommending to my reader friends. However, I know I am in the minority with my feelings on This is The Way it Ends by Eva Dolan, so if you enjoyed the excerpt and like the sound of the blurb, please go ahead and read This is The Way it Ends, and please let me know what you think of it. Eva Dolan has ventured into the sphere of the psychological thriller with This Is How It Ends. She has done it magnificently, bringing wit and depth to this tale of two women. We enter into a very different subculture. A rather fascinating and vibrant one. This is the world of the activist. These are the people who take direct action, rather than sitting at home and moaning about what is wrong with the world. The people who demonstrate in public, with placards and get the attention of authorities Eva Dolan has ventured into the sphere of the psychological thriller with This Is How It Ends. She has done it magnificently, bringing wit and depth to this tale of two women. We enter into a very different subculture. A rather fascinating and vibrant one. This is the world of the activist. These are the people who take direct action, rather than sitting at home and moaning about what is wrong with the world. The people who demonstrate in public, with placards and get the attention of authorities. The ones who end up being kettled by the police. Some cause disruption, damage property and take part in other criminal actions. It is a world of petty jealousies and competitiveness. They regard newcomers with suspicion. These are people who want to change the world. We meet two very different women, living this alternative lifestyle. The drama is followed from their two perspectives and jumps back and forwards between time-frames. Molly is the seasoned long term activist, who earned her stripes at Greenham Common. Ella is the young university Phd student and blogger, finding her feet and eager to make her mark against authority. We see they have a sort of mother/daughter relationship. Molly is protective and supportive of Ella, guiding her in this new environment. They are both camped out in a semi-derelict tower block in London, which is marked for development. They intend to be a thorn in the side of the developers, for as long as possible. Definitely we see shades of Grenfell Tower, as gentrification is a reality here. Social cleansing in action. There is a death. A man is killed. He is left in a lift shaft. Only Molly and Ella know what happened. We follow the drama, as both women have to deal with the emotional repercussions of this terrible event. This incident leads to an increasingly complex web of lies and deceit. Can Ella trust Molly? Can Molly trust Ella? This is incredible. A masterclass in uniting a strong storyline, with escalating tension and thoroughly complex characters. It is utterly unique. We get a dollop of realism. Dolan takes us right into the heart of this unfamiliar world, to see the realities of living an anti-establishment lifestyle. It is powerful. It is harsh. It is bleak. Although I guessed what was coming, I was completely enthralled by the way it played out. Clever. Brilliant. Stunning. Top marks! Ella is an activist for a just cause – she’s at the forefront of a movement to halt the ever expanding London skyline; the corporate empire dredging out the lower socio-economic families in rundown apartment housing for capital gain, pimping overseas investment growth. Molly is a tenant and former big league activist in her own right, past her corporate-fighting days, she’s now a top class photographer content to sit on the sidelines, capturing key moments of rallies, movements, celebrations, and Ella is an activist for a just cause – she’s at the forefront of a movement to halt the ever expanding London skyline; the corporate empire dredging out the lower socio-economic families in rundown apartment housing for capital gain, pimping overseas investment growth. Molly is a tenant and former big league activist in her own right, past her corporate-fighting days, she’s now a top class photographer content to sit on the sidelines, capturing key moments of rallies, movements, celebrations, and heartbreak to ensure the public eye isn’t tainted by political spin. The two form a bond through a common interest which evolves into a near mother-daughter relationship, a relationship which is tested to extremes when Molly unwittingly becomes an accomplice to murder. Told through present and past tense via alternating multi POV chapters between Ella and Molly, This is How it Ends is a cleverly written novel which traps the reader into the semi-false narrative of its protagonist. Well to be honest I’m not sure where to begin. I’m certainly sure that the end has left me with that melancholy, low key buzz of a feeling that all real readers will know when they’ve just finished a novel that will linger in the senses and be the benchmark for future reads for a long long time to come. Eva Dolan’s Zigic and Ferreira series is one of the best, most authentic police series out there but This Is How It Ends enters a whole new league of subtle brilliance that defies explanation in a Well to be honest I’m not sure where to begin. I’m certainly sure that the end has left me with that melancholy, low key buzz of a feeling that all real readers will know when they’ve just finished a novel that will linger in the senses and be the benchmark for future reads for a long long time to come. Eva Dolan’s Zigic and Ferreira series is one of the best, most authentic police series out there but This Is How It Ends enters a whole new league of subtle brilliance that defies explanation in any kind of review – things to note though are the beautifully immersive writing, the insightful and deeply layered characters and the ability to recreate the world we are living in without need for filter or fuss. Socially relevant, entertaining yes but also utterly genuine and just getting you right in the heart. Look this is classically good writing right? There are a plethora of brilliant crime and thriller writers around, using language in many different ways to entertain us, but there a few, those very few that just have that depth of emotion, that literary twist to the way they do things, that thing in their storytelling that tells you they were born to do this – and this author is one of those. She’s been showing us for a while now, but with this novel, undoubtedly for this reader her best so far, she’s hit that sweet spot that starts defining a writing career. Exquisitely understated prose that digs deep, two characters that you will live with, an utterly utterly riveting story with a final denouement that will leave you stunned, This Is How It Ends heads straight onto my favourites of all time list. No messing. Sometimes that’s just the way it is. Read this. This is what it’s all about. Eva Dolan is the real deal. Cleverly plotted and blindingly well written, this psychological thriller takes you into the world of social activism and murder. As with all of Dolan's work, it brings contemporary issues right to your front door, forming them into created situations that challenge the way you think, about people especially. She's not afraid to take you into grey areas and her characters are so complex, natural, and real, that they provoke a strong emotional reaction in you, like they really did just turn up on Cleverly plotted and blindingly well written, this psychological thriller takes you into the world of social activism and murder. As with all of Dolan's work, it brings contemporary issues right to your front door, forming them into created situations that challenge the way you think, about people especially. She's not afraid to take you into grey areas and her characters are so complex, natural, and real, that they provoke a strong emotional reaction in you, like they really did just turn up on your doorstep for a chat. And yet, this is why this book loses one star from me. Ella is so hard to spend time with that it's taken me a ridiculous amount of time to read a book I could usually finish in one sitting. I had to force myself to pick the book up again and each revelation about her character only made me dislike her more. Maybe this means I should be giving extra stars for such a brilliant creation on the part of the author, but if it wasn't this author, I would have put the book down, especially as the other main character, Molly, isn't that much easier to take. I can't even explain why as it's too spoilery and I think people should read the book anyway, but i'm very bloody pleased that it's over. This is a complex psychological thriller set in the world of social activism. Ella Riordan is a PhD student writing her thesis on social activism. At first the activists Ella wanted to interview were wary of her but after she was beaten by police at a rally, they began to talk to her. Now she has become involved in trying to stop the eviction of people from a low cost housing tower by developers planning to build a new expensive apartment block in its place. Ella has written a book about the evi This is a complex psychological thriller set in the world of social activism. Ella Riordan is a PhD student writing her thesis on social activism. At first the activists Ella wanted to interview were wary of her but after she was beaten by police at a rally, they began to talk to her. Now she has become involved in trying to stop the eviction of people from a low cost housing tower by developers planning to build a new expensive apartment block in its place. Ella has written a book about the evictions with her friend Molly, an older, experienced activist and photographer and they decide to hold a launch party on the roof of the housing tower. After the party a body is found in the elevator shaft. Ella claims to not know the man or have seen him at the party but Molly feels she is hiding something and wonders if she can really trust her. While Ella doesn’t get on well with her well off parents, Molly and Eva have almost a mother and daughter relationship which is central to this novel. Eva Dolan has used an interesting technique of telling Molly’s story going forward in time and Ella’s going backwards in time. The reason for this approach all makes sense when the threads all pull together with a giant twist at the end. A Brilliant, gritty, hopeless story. I loved the way the book was structured/implemented. Very, very clever. I admit it was difficult to get into the story as it goes back and forth between "then and now" from multiple PoV's in a chaotic way but, wow! The end was absolutely amazing and worth it. The characterisation was flawless. Molly was built skillfully and through her a lot of social issues were addressed, and having read so many books overcrowded with 'issues' I think it was very well balance A Brilliant, gritty, hopeless story. An enjoyable crime drama that demands your attention, focusing on people’s actions rather than the crime itself. The story opens as Ella calls Molly to help her as having attended a party and finds herself with a dead man. Ella convinces her friend that he attacked her first, but she feels that the police won’t believe her story and the pair try to hide the crime. I really An enjoyable crime drama that demands your attention, focusing on people’s actions rather than the crime itself. I really liked how the book instantly thrusts the reader into the story, which leads straight to the separate narrations. I’m glad that Dolan kept all the past POV’s to just the one character as it was easy to follow the timelines. But I do feel trying to keep close attention to the numerous switches every couple of pages did disrupt the follow of the story slightly. Molly starting to question Ella’s account of the events in the present day was really fascinating. I always relish a new Eva Dolan novel and this certainly lived up to my expectations. Once again, Eva has blown me away with this contemporary and eloquent piece of modern-day crime fiction. We learn the story of Ella and Molly who are both activi This is how it begins. Once again, Eva has blown me away with this contemporary and eloquent piece of modern-day crime fiction. We learn the story of Ella and Molly who are both activists. Ella is a young, ambitious and very creative with her blog. She’s hoping she can put a lot of input and energy into their campaign and impress Molly, the senior, most seasoned part of the group. I’m not going to go into how they both become involved with a body in a lift shaft. I’ll leave that for your own pleasure as it helps build the story. Everything about this book is finely tuned. Not only the storyline but the way that Eva tells the story in her wonderful and unique way. Very humane with her characters and so up to date with the research, this book could’ve been written in a few years time! Loved it and highly recommend! This book delivered one of my most conflicted reading experiences in recent memory! I absolutely loved its final 100 or so pages - but the earlier half of the book I found a bit slow and difficult to follow due to a plotline told in reverse chronological order. You can find my full thoughts on the book’s pros and cons in my blog post! If indeed this is ‘the most critically acclaimed crime thriller of 2018’ it’s going to be a very disappointing year for the genre. I’m not sure who gave the novel that subtitle, but it is quite inapplicable. I’m not sure how I managed not to stop reading this. Looking back I certainly should have stopped. There is very little to redeem this. I may not be it’s target audience, but I decided to read it based on a positive review on the CrimeReads website which is usually very reliable. Well that was a twist that I certainly did not see coming! The story of 2 women... a young activist and an older women who is like a mother figure. It jumps between the 2 women... before and after the body is thrown down the elevator shaft. What a fantastic page-turner! I found myself completely immersed in the fascinating and gripping narrative that alternates between the main protagonists - two women with complicated pasts and dark secrets. I did guess the twist early on BUT it actually didn't spoil my enthusiasm to find out how this would end at all. Highly recommended! First off, I have to say the writing was brilliant. I enjoyed the pacing, and the atmosphere that the author evoked. I really wanted to connect with the characters, but found to my disappointment that I really could not. This impacted on my overall enjoyment of the novel - I think it would have been a 5-star read otherwise. Perhaps the lives of the characters were just so far divergent from my own experience? I don't know... If I had to pick a favourite character it would be Molly Fader. Ultimately, this is a novel about betrayal. About how people who you would trust your life with can turn around and betray you in the worst ways. It asks the age old question, "Can you really EVER know another person?" This is my first read by Eva Dolan and I know that I want to read more of her work. The first novel in her Zigic and Ferraria police procedural series "Long Way Home" is on my TBR. I received a complimentary digital copy of this novel from Bloomsbury USA via NetGalley. This review is my small way of saying thank-you. Ella and her mentor, Molly, are both political activists and close friends. So when Ella appears with a dead man and a tepid story about what happened, Molly helps her hide the body without question. It is only later that Molly realizes she needs to find out the truth about what happened - and quickly, as her own life is now at stake. We experience the story through both Ella and Molly’s POVs. I was immediately drawn to Molly, an older activist who is looking toward her future and finding it gri Ella and her mentor, Molly, are both political activists and close friends. So when Ella appears with a dead man and a tepid story about what happened, Molly helps her hide the body without question. It is only later that Molly realizes she needs to find out the truth about what happened - and quickly, as her own life is now at stake. We experience the story through both Ella and Molly’s POVs. I was immediately drawn to Molly, an older activist who is looking toward her future and finding it grim. Molly’s motivations are simple, she has beliefs and she stands for them, even at the risk of being arrested or assaulted. Ella is a much more complicated, murky character. As we glimpse flashbacks into these women’s lives, twists and turns are revealed. Ella’s storyline was at times confusing to follow, but the last few chapters made everything shockingly clear. Fantastic! Eva Dolan does it again! I've read everything Eva Dolan has written and they've been marvellous but this one is utterly outstanding, enormously clever and a masterclass in plotting and reader immersion! Surely a book of the year. The first 3/4 of this book is slightly confusing told in reverse chronological order & super slowwwwww. The last 1/4 is faster paced & crazy good, ALMOST making up for the first part. Ella Riordan is a community activist who became famous when she was beaten by police during a social protest. Now Ella is a squatter in a building where the owners are evicting tenants so they can convert it into luxury condos. On a night where all the tenants and other guests are on the building's rooftop for a party, Ella finds herself next to a dead body. Instead of calling the cops, Ella calls a fellow neighbor and activist, Molly. Ella tells her friend the unknown man just attacked her and Ella Riordan is a community activist who became famous when she was beaten by police during a social protest. Now Ella is a squatter in a building where the owners are evicting tenants so they can convert it into luxury condos. On a night where all the tenants and other guests are on the building's rooftop for a party, Ella finds herself next to a dead body. Instead of calling the cops, Ella calls a fellow neighbor and activist, Molly. Ella tells her friend the unknown man just attacked her and it was an accident. Together the two women decide to hide the body. But soon after, Molly starts to see holes in Ella's story. This story was told in alternating point of views between Ella and Molly. I also got confused because it was jumping between the past and the present. I thought the story was slow and boring. I actually started skimming the book but I don't think I missed much. Ella and Molly are activists. Ella is young and new to the activist community, whereas Molly is older and has been involved with the activist community for years. They are both living in a building that is evicting the tenants, and most tenants have already left. After a rooftop party, Molly receives a call from Ella to come help her. When Molly arrives, there is a dead man in Ella's apartment. Due to the women's backgrounds, they don't think the police will believe they're innocent, so they opt Ella and Molly are activists. Ella is young and new to the activist community, whereas Molly is older and has been involved with the activist community for years. They are both living in a building that is evicting the tenants, and most tenants have already left. After a rooftop party, Molly receives a call from Ella to come help her. When Molly arrives, there is a dead man in Ella's apartment. Due to the women's backgrounds, they don't think the police will believe they're innocent, so they opt to dispose of his body and not report his death. As time progresses, mistrust grows between the two women. This story is told from two points of view, Ella and Molly. The book starts with the defining event (i.e., the dead guy) between these two women, then Ella's story moves in reverse chronological order, while Molly's story moves forward with the present day. The alternating viewpoints were interesting, because this is the type of story where that works, but the time changes (past vs present) were sometimes confusing. This was a quick read, but I wasn't really interested in the characters. I was never drawn into the story and fully immersed. The last half of the book was much more intriguing than the first half, and I did enjoy the twist at the end. a many layered tale which shows that your actions have ripples throughout your life, not just in the moment. This Is How It Ends is the first standalone novel by Eva Dolan and it is pretty amazing. It is based around a group of friends who protest against government, property developers and anybody who they feel is doing harm. With the state of the country there is plenty to protest about but their current project is the demolition of a block of flats that will have a huge impact on the lives of it’s inhabitants. Many people protest from the comfort of With thanks to the publisher for the copy received. This Is How It Ends is top shelf thriller. The gritty forgotten parts of London are exposed in this story about corruption, activism, police brutality, bullying, misogyny, and gentrification. It’s a sophisticated thriller like few are, topical in its chosen issues and sharply tense in its grim delivery. The characters are raw and real, the setting authentically atmospheric – right down to the last rat! Ella is an activist with a huge social media presence. On the surface she seethes with anger ab This Is How It Ends is top shelf thriller. The gritty forgotten parts of London are exposed in this story about corruption, activism, police brutality, bullying, misogyny, and gentrification. It’s a sophisticated thriller like few are, topical in its chosen issues and sharply tense in its grim delivery. The characters are raw and real, the setting authentically atmospheric – right down to the last rat! Ella is an activist with a huge social media presence. On the surface she seethes with anger about the gentrification of London; inner city corporate real estate corruption that sees offshore investors buying up property for tax evasion, driving up prices beyond local affordability and forcing existing residents out of their homes and out of their neighbourhoods. It’s a serious issue and Eva Dolan presents a thorough view on the ins and outs of it within the narrative quite early on, so you know exactly what’s happening from the get go. But Ella is a fake. At least, that was my impression early on. She talks the talk and sometimes walks the walk, but there are other things simmering beneath the surface with Ella; she’s definitely not who she makes out to be and uncovering her story sucked me in like few have before. Molly is an activist from way back. Presently in her 60s, her last fight is the one for her home. She has formed a bond with Ella, despite her closest comrades distrust of the young woman. I became rather invested in Molly’s story, that of a lonely old woman in dire financial straights, hanging onto her glory days while grooming Ella into her protégé. Or so she thought. Because when a body comes between them, Molly begins to realise that Ella is a liar and a fake, the depths of which she can hardly imagine until she can no longer avoid confronting the devastating truth. Who is the body? What is Ella’s real story? Why is Ella so filled with rage? These questions kept me turning the pages at a rapid pace late into the night. The story begins with the body and from this point on, it unfolds in two directions. Forwards, in the present day, with Molly; and backwards, with Ella, visiting key events in her history in reverse, all geared towards finally enlightening us to her full story. Towards the end of the novel, when you think you know everything, we come back to Ella in the present day alongside Molly in the present day, for the remainder of the story. But of course, you still don’t know everything. There are more revelations to come and an ending that leaves you feeling wounded, yet oddly satisfied as well. This manner of storytelling was sensational, utterly absorbing. I never knew anything unless the author wanted me to, and in a thriller, a genre that is often at risk of producing plots and characters that we’ve all seen before, it was a literary style device well utilised and executed with perfection. I’m keen to read more from Eva Dolan, she’s quite a force to be reckoned with. There’s plenty to mull over in this novel and plenty to feel your blood boil over as well. Ultimately, no matter what my thoughts about Ella eventuated into, there can be no doubts as to the origin of her anger and it’s justification. We have come so far, yet we still have such a long way to go. Thank you to Bloomsbury publishing for sending me a free copy of this book, in exchange of an honest review. All opinions are my own. This book didn't read like a typical thriller. I don't know necessarily how to explain it, but this book was very intricately written. Very atmospheric, I could vividly imagine things as I was reading them. I have never heard of Eva Dolan before, or came across any of her books. So my experience with her writing style is new. I was entranced at the beginning of this Thank you to Bloomsbury publishing for sending me a free copy of this book, in exchange of an honest review. All opinions are my own. I was entranced at the beginning of this book, then slowly I was loosing interest during the middle, but then the last 100 or so were brilliant! If the whole book had been as good as those last pages, it would have made for an amazing read. But for me, I felt bogged down. I do want to add that Eva Dolan has a very precise, and detailed writing style. I think she must be a very smart woman, she had included a lot of words, that I had no prior knowledge of, and was having to look up definitions. I do not think she is your typical Thriller writer. This was a very dreary book, the kind of book that you want to read when its grey and gloomy outside, curled up with a warm blanket and a hot drink. Eva Dolan is a great writer who usually tackles interesting subjects in her police procedurals, so I was very interested to read her latest stand-alone novel This is How it Ends. And Dolan has proven once again that it is possible to include current affairs topics into an engaging thriller without bogging the story down. Both of her two main protagonists, activists Ella and Molly, are intriguing and make a nice difference from your average mystery cast. These are women who are defying societal r Eva Dolan is a great writer who usually tackles interesting subjects in her police procedurals, so I was very interested to read her latest stand-alone novel This is How it Ends. And Dolan has proven once again that it is possible to include current affairs topics into an engaging thriller without bogging the story down. Both of her two main protagonists, activists Ella and Molly, are intriguing and make a nice difference from your average mystery cast. These are women who are defying societal rules, who swim against the stream, who are in trouble with police and live according to their own moral code. Whilst I didn’t love either of them, I found myself drawn irrevocably into their world, trying to work out what makes them tick. It is a very skilled writer indeed who can create such vivid imagery in readers’ minds whilst making them question the very topics that move the story along – and there is plenty of fodder there that could have come out of your evening news broadcast. The story is being told in two POVs, with Molly narrating the present, and Ella featuring in the backstory that leads up to the trouble the women find themselves in. The relationship between the two women is as intriguing and multi-layered as the events described, adding a depth to the story lacking in many other mysteries. Whilst Molly is a seasoned activist who lives life according to the principles she fights for and is not easily cowed, Ella is the archetypal young and passionate keyboard warrior who is still finding her feet in her defiance of authority. Ella’s background of growing up with a father high up in the police force makes her character all the more complex. With Molly acting as both a mother figure as well as a role model for young Ella, it is easy to see what binds the two women together – until the events that threaten that bond. Thank you to Netgalley and Bloomsbury Publishing for the free electronic copy of this novel and for giving me the opportunity to provide an honest review.